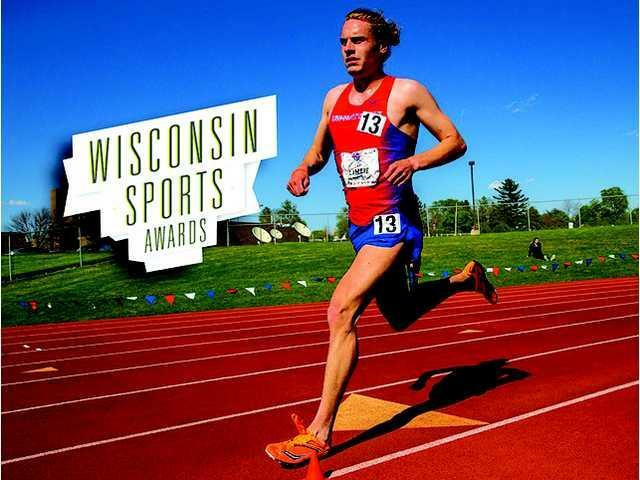 POSTED May 17, 2017 2:43 p.m.
NAPERVILLE, Ill. — At Thursday night’s Wisconsin Sports Awards ceremony, held at Camp Randall Stadium and the UW Field House, Ian LaMere was awarded the Small College Athlete of the Year award. He wasn’t present to accept the award because he was competing at North Central College’s Dr. Keeler Invitational. UW–Platteville’s LaMere won the 5,000 meters in a new school record and WIAC all-time best time of 13:56.76. The time is also third best in the Division III all-time best list. The race went off a little slower than expected and LaMere was not on pace to break 14 minutes with one kilometer to go. He was able to kick it up a gear and close the final kilometer in 2:43 to break the 14-minute barrier. LaMere now leads the nation with the fastest time of the season by 11 seconds. Also competing for the Pioneers was junior Walker Rynes in the 10,000 metrs. After finishing second at last weekend’s WIAC Championships, he was able to run over a 30-second personal best to finish 5th in 30:55.49. Rynes now ranks 29th in the Division III honor roll. Senior Chelsey Heiden ran a personal best of 37:09.44 in the women’s 10,000 meters. Sophomore Katie Wardinski just missed a personal best running 18:36.21 in the 5,000 meters.